Come one! Click here to play! Come all! Thrill Seekers are especially welcomed to this carnival. Feast on treats such as cotton candy, popcorn and ice cream, then test your nerves and stomach against the most exciting rides in world, and possibly in the universe. Relax on the rocking pirate ship, but watch out for when it flips. Brave the horrors of the Temple of the Skull Lord. Those Thrill Seekers looking for white-knuckle excitement need go no further than the Supershot Rollercoaster, fun for the whole family, while terrifying at the same time. The Thrill Seekers slots are certainly not for the whole family, but adults can get a thrill out of them. With bets possible from $0.01 per spin all the way to $1000 per spin, and 50 paylines to bet on, Thrill Seekers offers an experience like no other. 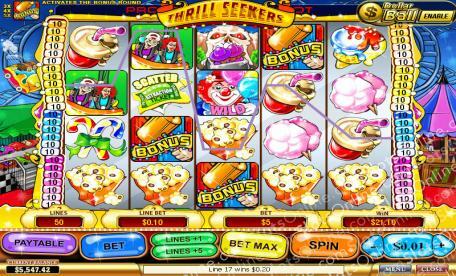 While low rollers are catered to, it is the high roller slots players, the real Thrill Seekers of slots, who will get the most out if this game. This carnival never closes, but you're missing out on the fun! Get on over to the Thrill Seekers slots and prepare for an adrenaline rush like you'd normally only experience on a carnival ride. Ticket symbols are scatter symbols that give free spins. 3 symbols give 10 free spins, 4 give 50 free spins. 5 ticket symbols give 200 free spins. Clown symbols are wild, and may count as any symbol except for bonus and scatter symbols. Also, they can provide higher payouts, with 2 capable of paying 10 times the payline bet, 3 paying 200 times the bet, 4 paying 2000 times the bet, and 5 wld symbols paying out 10000 times the payline bet. 3 to 5 hammer symbols on an active payline trigger the bonus game. In the game, you simply press a button to have the clown hit the strength tester with his hammer. This will determine the prize you win.